WT said: "We love book stores and have been traveling Europe for 16 months with a 7 year-old voracious reader who never met a book store that she did not love. Here is a great one in Florence." BM Bookshop is probably the oldest English language bookshop in Florence, Italy. It was opened some fifty years ago by Libby, an American, and her husband Francesco, an Italian from Florence. The main boast of this bookshop is the enormous range of Italian cookery books, tourist guides and books on art, architecture, design and fashion in English. Recently they have added a French, German and a Spanish language section to their existing English one. If, after shopping, you find your purchases too heavy to carry home, it is possible to arrange their direct delivery anywhere in the world. BM Bookshop is a warm and friendly reference point for English speaking people, located in central Florence, close to the Westin Excelsior and Grand Hotel. BM Bookshop is one of the finest and most personalized English language bookstores in Italy, with a very long tradition, having been established in 1963. They offer the customers an extensive selection with an eye for real quality. Here you can find a large collection of books of Italian interests, including art, cooking, and history; coffee-table books, translations from Italian authors, design, fashion, jewelry and much more. From bestsellers, paperback fiction and non-fiction, recent travel guides, maps, and phrasebooks to children’s books, new and rare, including classic tales about Italian traditions and folklore. 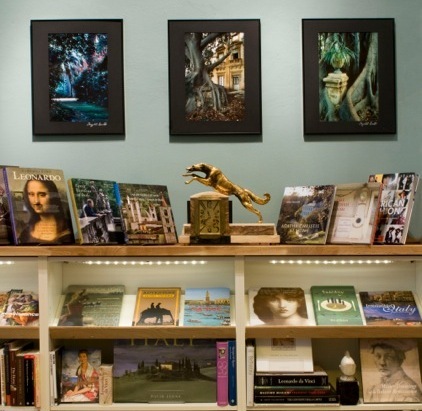 They have a large selection of old and rare books on Italian culture, history and literature. Furthermore, they carry a unique collection of English and American vintage teapots, bookends and porcelain.